The Sochi 2014 Winter Olympics are starting tomorrow and we've got the perfect Canadian Toque for you, your family or group! This Red and White beauty is reversible, with maple leafs on one side and Canada on the other, making this toque twice the value. The AC2550 Maple Leaf Toque has a special triple layer jacquard technique to give it a high definition design pattern. 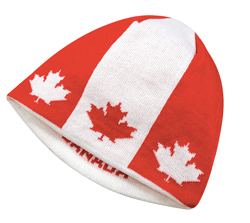 So if you're truly Canadian and want to support our Olympic team, this might be your toque!